Always do your grocery shopping alone. Keep the husband and kids home. You will spend less money. Are your closets overflowing with outgrown or outdated clothes, games, or toys? Do you have furniture or gadgets crammed into an already small living space? Have a yard sale or visit the local consignment shop to earn cash for your cast offs. Declare a mall moratorium. Staying away from the mall can save your family all sorts of money: no impulse buying, no pricey snacks, and no jumping on the latest trend train. Instead, plan family outings to the park, museums (ask for family discounts), or movie matinees. Be sure to pack your own snacks. Play the savings game. Choose an item your family really wants and launch a family wide savings campaign. Assign the older kids to price. Ask for dented and damaged goods. My friend saved $500 on a name brand heater with peeling paint; I saved $l50 on new clothes dryer with a dinged corner. Be on the lookout for candles (for emergencies), dishes, wallpaper remnants (for wrapping paper), patterns, yarn, sewing supplies, wool pants for winter outings, classic clothing, and other versatile items. Big Ticket Items: Shop around by phone or online for mortgages and car financing. Ask lots of questions. If you don't want to handle the math, ask the companies you are dealing with to do the figuring for you. Collect you lose change in jar and then count & bank it, you will be surprised how much you can bank. Do your own nails or learn to trim the kids' hair. Don't trust the scanners at check-out counters. They make mistakes. Eat at home. Sound impossible? In our fast paced lives, fast food is expensive and often a bad nutritional choice. To trim the fat, stay out of the drive-through line and stay away from restaurants. If you must resort to food someone else cooked, order in pizza or bring home take-out. This saves on expensive drinks and half-eaten plates of food. When you eat out, always doggie bag leftovers. Find a bank where you don't have to pay account fees. Find a good mechanic for your car before you are in a crisis situation. Find someone who you can trust. Take a recommendation from a friend and see how long they have been in business in your community. Check their certification, and ask how they will communicate with you about repair costs and options. When it comes to your auto insurance, shop around. Check the NET for a list of comparison prices charged by different companies. Grocery Shopping: Use a list when grocery shopping. Don't leave home without it. If possible, go solo; leaving the kids at home makes your trip to the store go faster and you don't get sucked in to buying expensive products they've seen on TV that you don't need. Also shop after you've eaten. Visit your nearest cut-rate department store or price club to stock up on the following non-food items: brushes, cigarettes, dish detergents, garbage bags, laundry detergents, paper napkins, shampoo, tissues, toilet paper, and toothpaste. Buy the economy size and snap up specials like buy-one, get one-free or 50% off the second item. Go for generics. You've heard it before and it's true. Based on chemical studies, maintain that the generic items have exactly the same ingredients as their more high priced, name brand counterparts: cooking oils (except olive), dried fruits, herbs, honey, lemon juice, molasses, non-fat powdered milk, orange juice, salt, spices, sugar, unbleached flour, and walnuts. Buy snacks in bulk and divide them into smaller portions. You can save big if you don't buy individualized portions of cheese, yoghurt, juice, snack crackers, and dried fruit. Go veggie! At least once a week, serve a vegetarian main course such as beans, vegetable lasagna, or pasta. A family of four can save $5 to $l0 a week just by eating a dinner without meat. Hand wipes: Make your own by putting three capfuls of baby shampoo into a spray bottle full of water. It works well and costs a lot less. Hit the library. Instead of shelling out money for video rentals, check movies out from the library. They're free. So are the books that you and your kids could be reading rather than staring at the tube or playing video games. Raid and get paid! If you are buying from a dealer, check out a half dozen of them, and be sure and let them know you are looking around. When you leave the first time, they won't expect you to come back. When you do come back, they will think they have a sale. They will not offer you the best deal until you start to walk away again. If you are shopping for a mortgage, or refinancing your home, look for the lowest rate with the smallest amount of points and closing costs. If you can't afford a 15 year mortgage, try and at least pay a little extra to the principal each month. Extra principal paid at the beginning of a mortgage will save thousands of dollars in interest as well as knock several years off the loan. If you have an old car, you may not want Collision coverage- just Liability. Be sure and take advantage of Homeowner Insurance Discounts for alarm systems, fire extinguishers, non-smokers, good driving records, good grades for students, a and carrying multi-line insurance with the same company. If you must buy name brands- consider setting up an extensive filing system for coupons and rebates. If you must use your credit card, keep a running total of everything you've charged during the month. Subtract each purchase from your misc. money in your budget. That way you will always know if you are on budget or charging more than you can pay off when the bill comes. Join a discount warehouse. If you don't qualify to join, buy one share of their stock. Be sure and hold the stock certificate yourself. If a brokerage holds it for you, they will charge you for that service. Keep your deductibles as high as you feel comfortable with. Keep your engine tuned and your tired inflated for the best mileage. 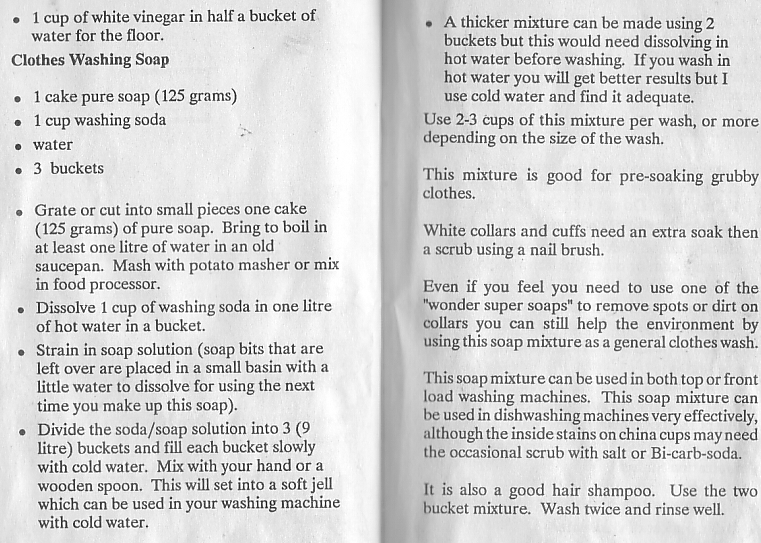 Make your own soap for washing your clothes. My recipe here. Many stores have the policy to match their competitor's prices. If you see something in the newspaper that you want, but don't want to travel to that particular store to get it, cut out the advertisement and take it to your local store. Need a major appliance? Try auctions. I have bought so well at these. Cars, furniture, (Bedroom-lounge room), jewellery, golf clubs, fishing lines, tools. Often when prices increase, it doesn't apply to the items already marked. When buying food, look for the expiration date and buy the newest item. Pare down to absolute necessities. Pump your own gas. Use the lowest octane your car manual recommends. Save Here: Cancel your subscriptions. Shop the thrift stores with regularity. Know which ones have the best prices. Track your discretionary spending. For one month, jot down every single item you buy to get a handle on what and where you spend. Try to cut down I magazines, books, CDs and eating out. Say, "No" to all impulse buying for 30 days. No mall crawls and no " I want it and it's on sale." Buy nothing but essentials. It is possible and you can do it. they can say is "No." Use a budget. Stick to it. Budgets go a long way toward helping you save. Use the Internet for price checking--before you buy. Almost everything is sold online; the Net is a great resource for getting the low-down on the lowest price. What about that pile of unread fitness magazines? Is your weekly Time or Newsweek actually getting read? Do you have time to read the newspaper every day or, given your crammed schedule, is that just wishful thinking? Be ruthless: If you don't read it, cancel it. When buying a non food item, always look in the back to see if you can find the identical item marked at a lower price. When possible, know the price of what you are buying, and watch it scan. When you buy a car, pick one that combines low price, low petrol kilometres, lower insurance premiums, and low maintenance and repair costs. Your will save thousands of dollars over the lifetime of the car. When you need new tyres for your car, try and find some that are marked as blemished. They are considerably cheaper. They are just as safe as new ones, and usually carry the same warranty. When you use your dishwasher, stop it before the drying cycle, and open the door to air dry your dishes.